Cost? See chamber website (cedarkey.org) for boat rentals, boat shuttles and prices. Description: Each of the fifty states has an official state song, however most U.S. residents would be hard pressed to recognize their own state’s song, even if it were sung for them. Such is not the case for the state song of Florida, Old Folks at Home, written by Stephen Foster, who ironically never stepped foot in the state. The song’s famous first line, “Way down upon the Swanee River,” refers to the Suwannee River that empties into the Gulf of Mexico along a sparsely populated section of the Floridian coast, fifty miles southwest of Gainesville. Just south of the entrance to the Suwannee River is found a group of low-lying islands known as the Cedar Keys. The individual islands have colorful names like Rattlesnake Key, Grassy Key, Deadmans Key, and Seahorse Key (named so because its contour resembles a seahorse), but the name for the collection of islands stems from the stands of Cedar trees formerly found thereon. During the Second Seminole Indian War (1835-1842), the U.S. military occupied the Cedar Keys. A supply depot and hospital were established on Atsena Otie Key, while Seahorse Key was used as a detention camp for Indians being relocated to the West. During this conflict, General Zachary Taylor requested that the Cedar Keys be reserved for military purposes. “The outer key (Seahorse Key) of the group the Government should retain,” he wrote, “as on it will no doubt be erected, at some future time, a lighthouse for the benefit of vessels trading to the Suwanee River.”Taylor had the authority to make his prophecy come to pass as he was elected President of the United Sates in 1849, however, he died after just over a year in office. In September 1850, two months following the death of President Taylor, his prophecy was fulfilled, when Congress appropriated $8,000 for the erection of Seahorse Key Lighthouse. Taylor’s successor, Millard Fillmore issued an executive order on September 2, 1851, officially reserving Seahorse Key for lighthouse purposes. The following year an additional $4,000 was earmarked for the lighthouse. Florida’s first senator, David Levy Yulee was instrumental in establishing a railroad line that linked Fernandina on the state’s east coast to Cedar Keys. Construction began in 1853, and reached Cedar Keys in 1860. The newly completed railroad was considered Florida’s finest. 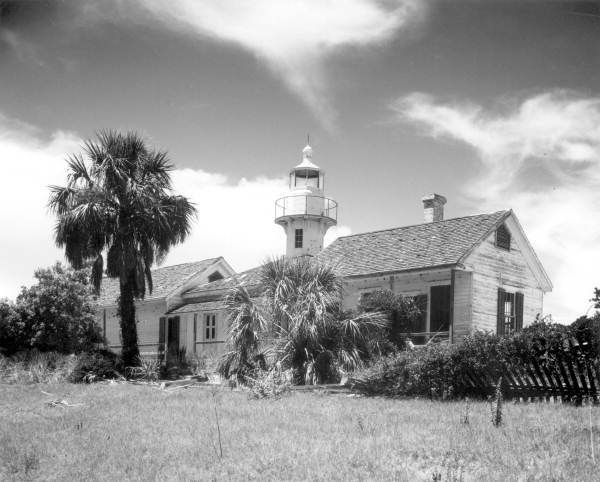 However, service and life in general, was interrupted the following year when the Civil War broke out.Cedar Keys Lighthouse was extinguished at the onset of the war, and in January 1862, Union forces aboard the USS Hatteras blockaded the keys, ruined the port and rail terminus at Cedar Key, and destroyed all structures of military value at Seahorse Key. Following the war, the lighthouse was returned to service on August 23, 1866, after having been overhauled and repaired. That same year, William Wilson, the first keeper of the light who had served just under a year, was buried on the island.